A researcher from the University of Houston known for his groundbreaking work in crystal engineering has received the 2018 Norman Hackerman Award in Chemical Research. 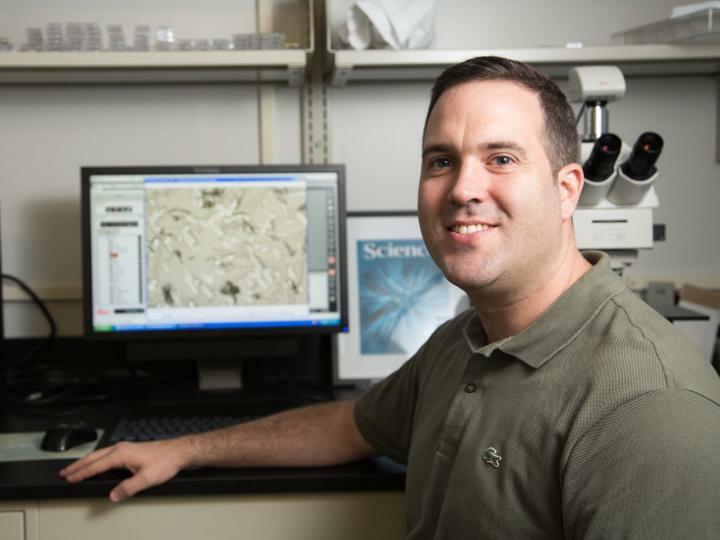 Jeffrey Rimer, associate professor of chemical and biomolecular engineering, will be recognized at a luncheon later this month. "Dr. Rimer is widely recognized as an outstanding teacher and mentor, as evidenced by the deep scholarship and innovation produced in his lab," said Peter B. Dervan, Bren Professor of Chemistry at the California Institute of Technology and chairman of the Welch Foundation scientific advisory board. "He has become a leader in the emerging field of non-classical crystallization." Rimer said the award is especially gratifying because of the foundation's support for fundamental science. His lab has received funding from the foundation since 2012. "To receive an award from the Welch Foundation is special. It is very rare to have an organization that funds fundamental, science-driven research," he said. "Welch funding has been transformative by allowing me to expand my research program into different areas." In 2016, Rimer reported that a natural fruit extract can dissolve calcium oxalate crystals, the most common component of human kidney stones, suggesting a major advance in drug development. That work is continuing, with human clinical trials underway and research to find new drug candidates ongoing. He earlier reported new techniques to view zeolite surface growth in real time, work which has applications in the petrochemical industry. He received the 2016 Owens Corning Early Career Award and 2017 FRI/John G. Kunesh Award from the American Institute of Chemical Engineers, as well as multiple teaching and research excellence awards from UH. Joseph Tedesco, dean of the UH Cullen College of Engineering, said it's difficult to overstate the impact that Rimer's work has had on the world. "Dr. Rimer is responsible for some of the most significant breakthroughs in the field of crystallization in the last few decades, but his equal devotion to teaching the next generation of innovators, problem-solvers and entrepreneurs is what truly makes him shine in his field," Tedesco said. "This Hackerman Award is well-deserved recognition of the caliber and breadth of his work." Rimer said his work with crystallization is an example of the benefits of basic research. "If you focus on the fundamentals, then you can branch out into different research areas," he said. "The materials may change, the applications can be dramatically different, but the fundamentals provide a foundation that ties them together and fosters cross-cutting, interdisciplinary research. When you take a set of practices or techniques from one field of research and find ways to uniquely apply them to others, this is often an effective approach to materials design that can lead to new paradigms." Olafs Daugulis, Robert A. Welch Chair of Chemistry at UH, received the Hackerman Award in 2013. The Welch Foundation, based in Houston, is one of the nation's largest private funding sources for basic chemical research. Since 1954, it has distributed $866 million in research grants, departmental programs, endowed chairs and other special projects at educational institutions in Texas. The Hackerman award, which was announced Thursday, includes a bronze sculpture and $100,000.